ETR is a primary technology market research firm, capturing real-time evaluations and spending intentions from thousands of enterprise-leading technologists. For almost 10 years, Global 2000 corporations have trusted ETR’s proprietary technology research to capture real-time market activity. ETR produces market research through standardized surveys and round table discussions, not analyst opinions – our data driven approach quantifies the narrative driving the technology landscape. Marketing, Investor Relations, Corporate Strategy and Corporate Venture Capital teams no longer need to rely on anecdotal evidence to make business decisions. Vendors covered in our surveys gain mindshare among global IT leadership & gain key insights into navigating their competitive landscapes. For almost 10 years, CIOs and IT executives have trusted ETR’s proprietary technology research to capture real-time market activity and make informed, data-driven decisions. IT departments are challenged by declining budgets and the ever changing IT landscape, and leadership must ensure the right technologies and services are being procured. As such, ETR has spent the last decade building a 4000 member global CIO community to track the pulse of enterprise IT spend. For almost 10 years, investment professionals globally have trusted ETR’s proprietary technology data during every step of the investment process. Mine millions of proprietary data-points, models, quantitative analyses and reports to better manage your portfolio. IT leadership in Government rely on ETR to help them make informed, data-driven decisions - ETR was selected to market, assess and assist in the commercialization of emerging technologies for the Transition to Practice Program (TTP) at the DHS Science and Technology office. Government IT departments are challenged by declining budgets and the ever changing IT landscape, and must be cost conscious and ensure the right technologies and services are being procured. As such, consumer data drives ETR’s recommendations, not analyst opinions – our data driven approach has improved the process government agencies use to procure and invest in technologies. Benchmark your department’s IT architecture against your peers. We track enterprise IT spend by over 60 subsamples (Fortune 100, Large Financial Organizations, Midsize & Small Businesses, US Government, Healthcare, Large TelCo, etc.). View spend across different product lines to hone in on key areas of strength and weakness to maximize Marketing ROI. Use ETR’s time series models to gauge your trajectory in the wider market and determine which marketing changes are positively affecting long term growth + top line growth opportunities. Track critical metrics overtime such as customer Adoption & Acceleration, Replacement & Deceleration, and Market Share Shifts. Peer benchmarking tools measure share loss/gain against competitors. Our ability to quantify market share movements help our leading technologists procure best in breed technologies and Contain/Replace those soon to be obsolete. Adoption + Replacement Drivers. Track the reasoning behind the enterprise spend, such as Long Term ROI, Cost, Compatibility with Existing IT Skills, Feature Set, and more. Easily analyze and compare why vendors are being deployed or replaced in the enterprise IT stack. Commission custom surveys with our research team. Our drill down surveys are carefully crafted and sampling is curated based on analytics. The end result: the right questions go to the right people, which results in thoughtful answers. Drill down surveys receive ~150 CIO indications within 24 hours. View Fortune 500 enterprise IT budgets, directionally and sector/vendor specific. Identify disruptive/emerging technologies and vendors soon to be obsolete. Hone in on what the enterprise and your peers are Adopting/Replacing in minutes by filtering and ranking datasets. ETR's events & content platform organizes round table discussions within our technology ecosystem of CIOs, tech companies, and investors. 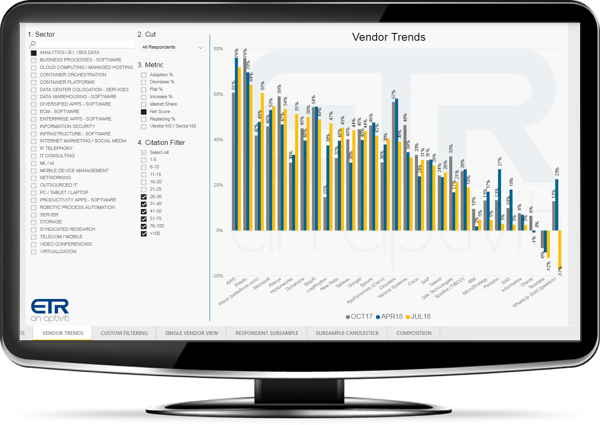 VENN pairs ETR’s quantitative findings of who, what, when and where- with the vital qualitative reasoning of why vendors are seeing more or less spend.